The sides and back of this flamboyant 'do are clipper cut short and close to the head while the top is teased and styled up for height and shape. This stunning 'do is perfect to compliment an oval face and needs strong hold product to keep it in place all day or night. Regular trims is needed every 4-6 weeks to maintain shape. 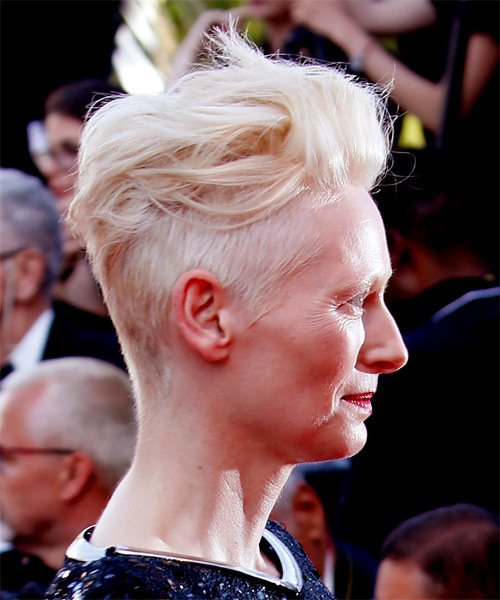 Tilda Swindon is working her cool â€˜do here with ease. This edgy cut features a fauxhawk on top with clipper-cut sides. This is a signature look that Tilda likes to wear as it not only compliments her face but also her edgy fashion sense. This â€˜do has backcombed layers on top that are styled up off the face and towards the back of the head for a windblown look. This works nicely with Tildaâ€™s oval face shape, which can pull off this look with ease. Her fine hair type works well too, as it benefits from added volume and texture on the top. Tilda's color is just right for this hairdo, with a platinum blonde shade all over to complete her futuristic, fashionable look. The white blonde shade goes well with her cool complexion and vibrant blue eyes. Regular toner treatments are needed to keep this blonde looking icy cool and not brassy. 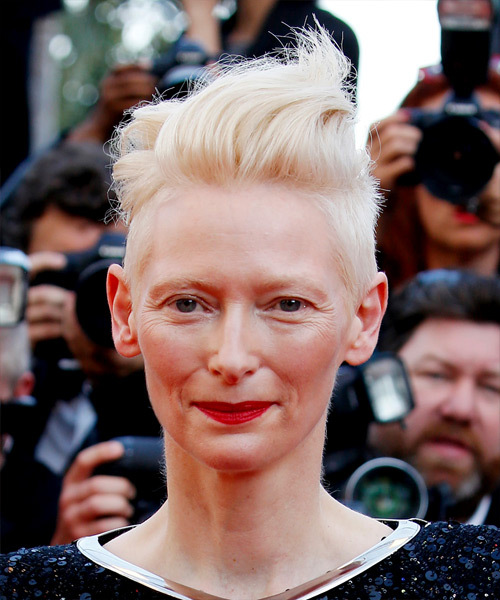 Katherine Matilda "Tilda" Swinton is a British actress, performance artist, model, and fashion muse, known for her roles in arthouse and independent films to Hollywood films productions. Use a fine tooth comb to backcomb the crown for extra lift.